This Christmas, I've decided to give edible gifts. Home cooked and packed in jars, tins, brown paper and pretty glass urns. I've also decided to theme it around my favourite things! Of course, like most good mediterranean girls, I love feta. In fact, I look for excuses to put it on everything...pasta, salads, soups, crackers. It actually makes everything in life better. This is quite possibly the easiest and most delicious thing you can do to your feta the day before you plan on using it. The flavour combination of the garlic and thyme is heavenly, and its food like this that is the reason why I cannot commit to complete veganism. Quit judging. So here's the formula. So easy, you couldn't mess it up if you tried, cause really - there are no rules. With a mortar and pestle, pulp up 2 cloves of garlic for every 300 gram jar Add approx 3 tablespoons of extra virgin olive oil and mix it up Begin to layer the jar in 3 sections until full: Feta, one tablespoon of garlic pulp mix, and 3 coiled sprigs of thyme Once the jar is full of feta and garlic thyme goodness, fill to the top with olive oil, seal and refrigerate. 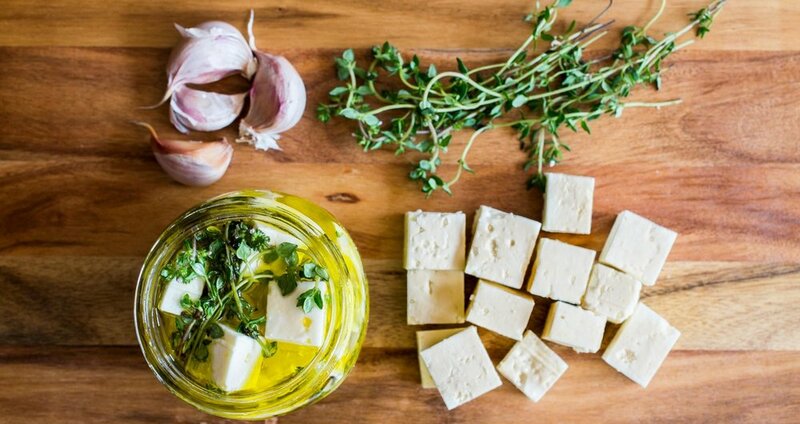 The next time you plan on bringing salad to a party, just top it with this feta. But you might be inundated with recipe requests once everyone finds out you made that shiz. P.S - Use the oil and some fresh lemon to dress that salad too. Nothing goes to waste...nothing.